Breakfast is the hardest meal for me. I’m lazy about cooking anything early in the morning, which means I often don’t eat much, making it that much harder to lose weight. 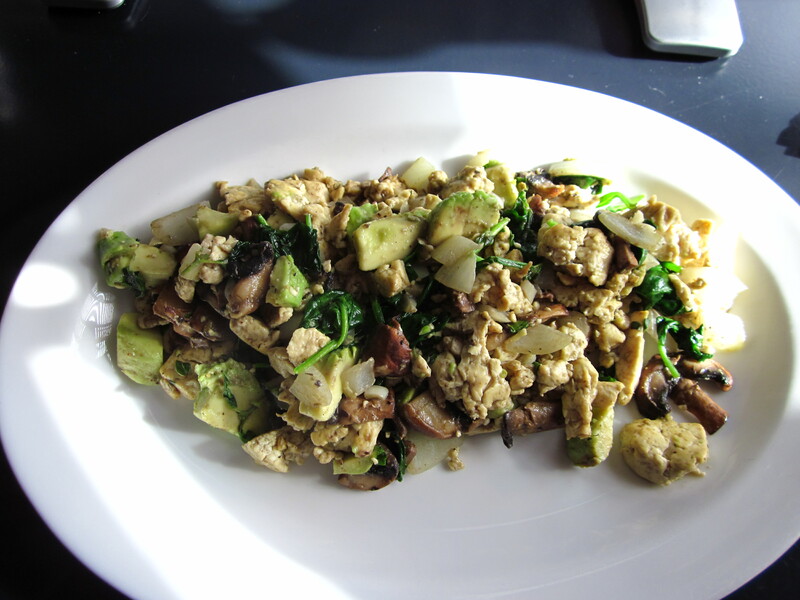 This morning, I decided to try making a tofu scramble since I can’t tolerate eggs. It never really sounded appealing to me, but since I hate eating cereal without real milk, I decided to give it a try. It actually tasted pretty good and I’ll most likely make it again. Below is my recipe. In a non-stick pan, heat oil on medium. Crumble tofu into pan and cook until the liquid is cooked off. Use a spatula to turn tofu and continue cooking until it’s a light, golden brown. Add all ingredients except the avocado. Saute until veggies are cooked to taste. Add the avocado, give it a couple of quick tosses to heat slightly.